Written by the Trainer of President and Barbara Bush's dog (and author in her own right), Millie! All owners will find fun things to do with the family pet in this all-new book based on the sound training philosophy of Mary Ann Rombold Zeigenfuse, Millie's trainer. 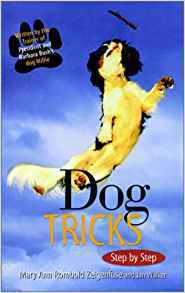 Without rules and regimentation, the book's format gives a built-in success formula by allowing owners to teach those tricks best suited to their pet. Owners can devise an individual Personality Profile for each dog, which allows everyone to have a choice of tricks. There are practical tricks to make the dog useful at home; simple tricks, to build a rapport between dog and owner; and cute tricks, great just for showing off. Full color and extraordinary original artwork throughout complement the easy-to-follow, step-by-step instruction, whether you want to prepare your dog for show biz or simply want to have some fun.